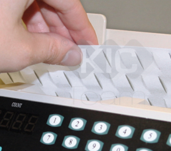 This cleaning card was designed to clean currency counters over a wide range of manufactures. The unique waffles clean note recognition lenses and the surfaces around the belts and rollers, removing debris and other types of products. The card will clean rollers and clean paths and also burnish rollers if held briefly on place prior to releasing into the equipment. Maintaining these critical components, on a regular basis, will prolong the life of the unit and allow the currency counter to operate more efficiently. This cleaning card was designed to clean currency counters over a wide range of manufactures. The design of the card will clean note recognition lenses and the surfaces around the belts and rollers, removing debris and other types of products. The card will clean rollers and clean paths and also burnish rollers if held briefly on place prior to releasing into the equipment. Maintaining these critical components, on a regular basis, will prolong the life of the unit and allow the currency counter to operate more efficiently.